Fostering practices that awaken connection with self, others, and the natural world. we are on a journey to recover, reimagine, and begin anew. A year since the Thomas Fire and the recovery effort continues. Help us build a bridge to our future re-opening. Come help with the fire recovery effort by joining a volunteer day on the land. Eagle’s eye view of The Ojai Foundation after the Thomas Fire. The Ojai Foundation is a 36-acre educational nonprofit located in the Upper Ojai Valley. For over 40 years, our land and programs have been a beacon for youth and adults seeking ways to deepen relationship with self, each other, and the natural world. Council, the practice of listening and speaking from the heart, is our foundational offering and core to all we do. 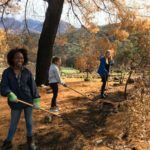 On December 5, 2017, the Thomas Fire raged through The Ojai Foundation land taking over 24 structures, including our staff residence, two program kitchens and all of our overnight hermitages. In early spring, we launched our RECOVER & REIMAGINE Campaign to raise the funds needed for clean-up and recovery, as well as for a period of listening together for how best to begin anew. As of May 20, the monumental task of debris removal is complete, allowing us to focus on basic infrastructure, damaged buildings and the gardens, hillsides and forest; while continuing to reimagine and chart our future. Please check back regularly and join our mailing list for updates, ongoing events, and ways to support and stay connected. Financial contributions continue to be gratefully accepted. The land sanctuary is currently closed for an undetermined period while we attend to recovery and renewal.